(Caspionet) – A helicopter assembly line is now in operation in Kazakhstan. The first examples of the aircraft intended for emergency services and the Kazakh Ministry of Defence were presented on Thursday in Astana. is a twin-engine light utility helicopter manufactured by Eurocopter. Originally referred to as the BK 117 C2, the EC145 is based upon the MBB/Kawasaki BK 117 C1, which became a part of the Eurocopter line-up in 1992 when the company was formed through the merger of the Messerschmitt-Bölkow-Blohm helicopter division of Daimler-Benz and the helicopter division of Aérospatiale-Matra. The EC145 is a twin-engine aircraft and can carry up to nine passengers along with two crew, depending on customer configuration. The helicopter is marketed for passenger transport, corporate transport, emergency medical services, search and rescue, parapublic and utility roles. The Kazakh-French joint-venture plant will be running at its designed capacity as early as April next year. The first two helicopters assembled in Kazakhstan are undergoing test flights. The Eurocopter EC145 is one of the most popular models in the world. The light twin-engined chopper has a top speed of 300 km/h. 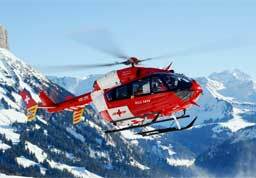 It is ideally suited for the needs of emergency medical agencies, rescue services and police and border patrolling. So far, Kazakhstan is producing 10 helicopters a year. However, the assembly is now receiving orders from both Kazakhstan and abroad. The first six EC145s to be assembled at Eurocopter Kazakhstan Engineering’s facility at Astana Airport are to be utilized by Kazakhstan’s Defense Ministry and the Ministry of Emergency Situations for such operations as medical airlift and search & rescue missions.